So! After yesterday's daring procurement of prickly pears... today was the moment of truth. 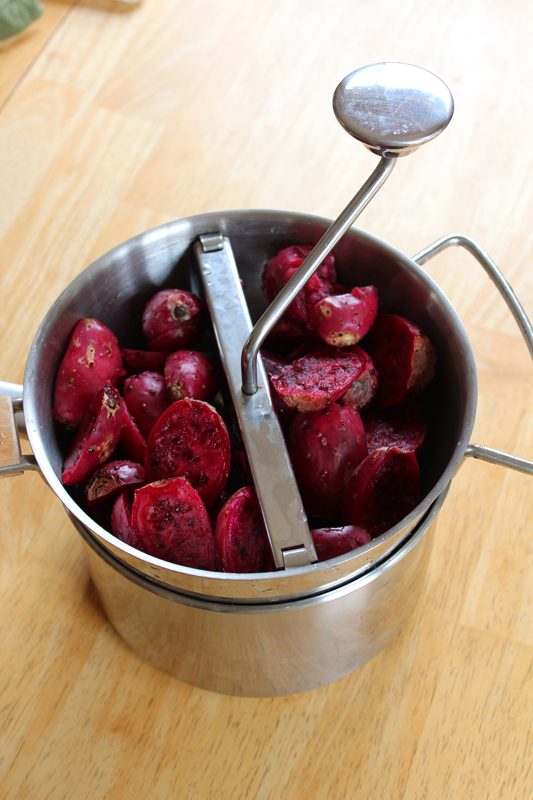 After looking around online, I decided to try to make myself some prickly pear juice with my small batch of fruits. The first step is removing the nearly-microscopic, nearly-invisible, barbed little spines of nastiness from the skin of the fruits. 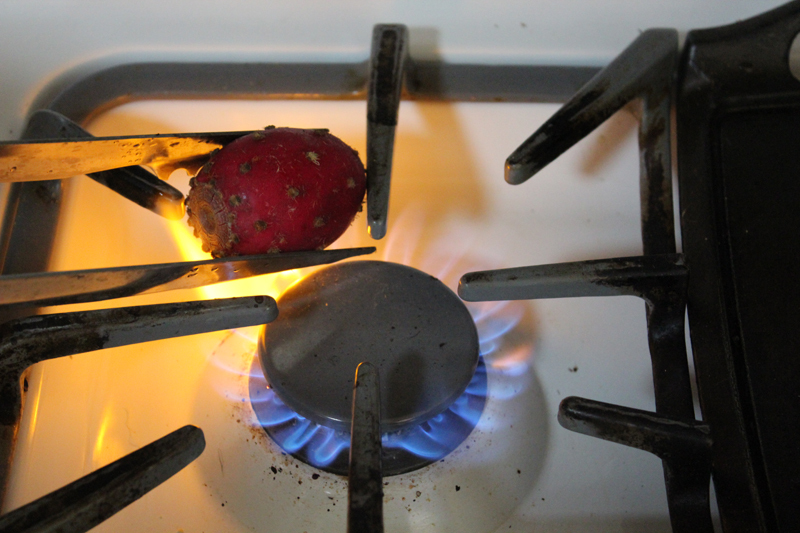 Some sites suggested burning the spines off over the burner, and others suggested rinsing them off under running water. 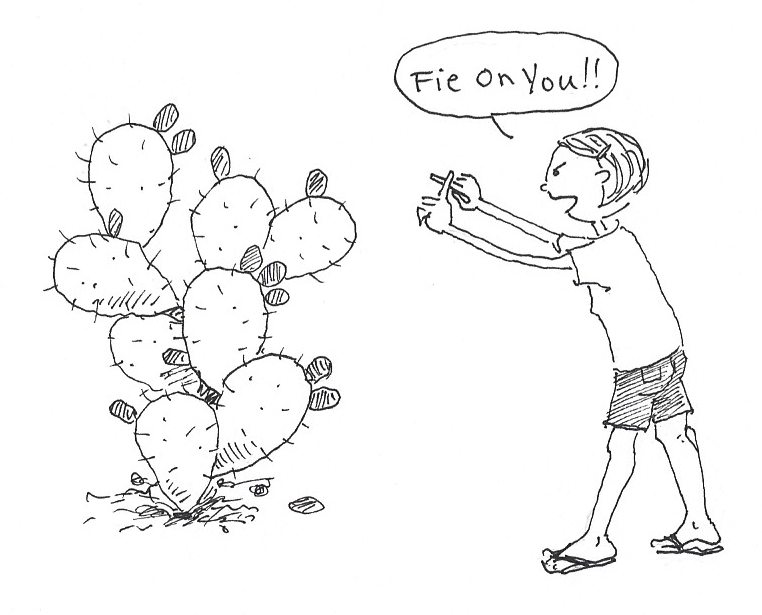 Based on my last prickly pear experience - countless years ago - I decided to do BOTH of these methods. Burning off the spines was sorta hard, because I had to keep re-positioning my grip on the fruit with the tongs - to make sure I was burning them off. But, it was nice how they lit up in flames when they were burning. Begone foul jerks! Here are the fruits after each being singed on the open flame. Burning off the fuzzy spines also made the skin of the fruit turn glossy and darker red, which is pretty. The little nubs where the spikes had been turned black, but there were still some errant fuzzy bits around and I wanted none of that. 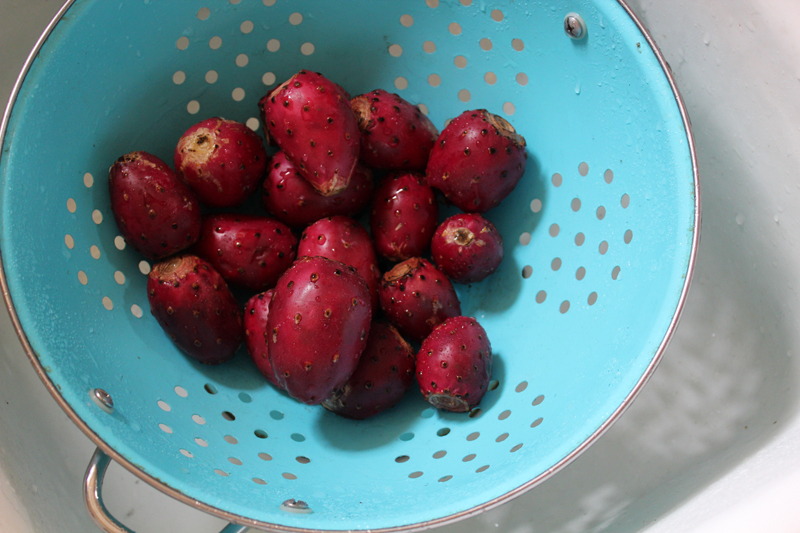 So, I also rinsed them and tumbled them around in the colander - a few times. I was so paranoid about getting all those nasty little pricklers off! Next up, I cut my fruits in half and plopped them into my food mill. In retrospect, I should have probably cut them into chunks, because it took forever to grind out the juice. The fruits have seeds inside which are really hard - you can eat them, but you wouldn't want to bite into one. And the skins must be avoided because of those prickers. 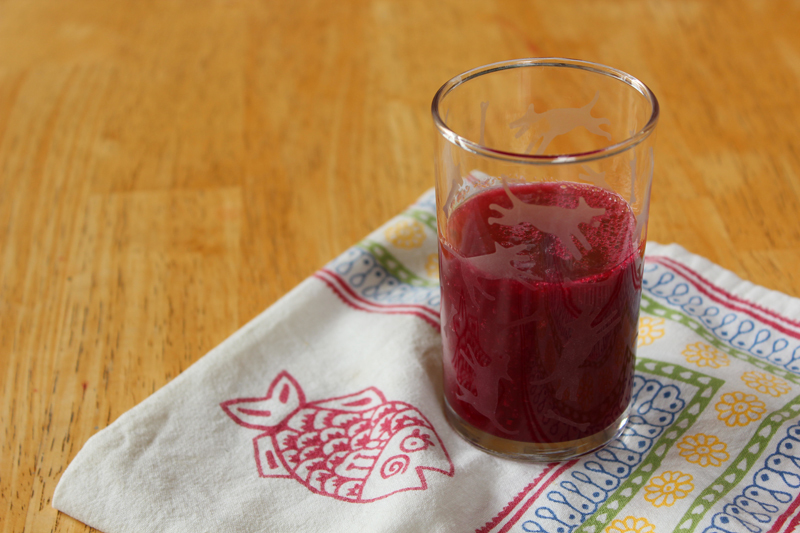 Using the food mill, I ground and stirred for a while and ended up with a couple cups of juice - from my small bowl of fruits. The seeds and skins are sorta slimy and mucilaginous - which gives the pulp a really slippery feel. In fact, even the juice itself has a slippery sorta mouthfeel. The final verdict? Not worth the effort. The juice is okay, but nothing special or particularly yummy... and that was a lot of hassle. Plus, after burning off the pricklies, the juice actually has a faint smokey flavor, which isn't usually a quality I shoot for in my fruit juice. Plus. Despite all my extreme efforts of proper technique, I have been getting stabbed and poked by invisible little thorns all afternoon long and it is driving me NUTS. Those little buggers hurt! Usually I can find them, and pull them out, but not always. And now I have this itchy feeling like they are all over me. I guess the moral of this story is that it is 100% impossible to avoid those devilish little barbs and prickly pears are a jerky fruit. They look pretty, but they are actually just like sirens on the open sea, and you should avoid them at all costs. A lesson to us all. Also, my Smoked Juice food cart idea will go back to the drawing board. An epic tale of bravery! thank you for recognizing my heroism! That's some serious commitment right there. I'm impressed! Don't know about smokey juice though, I'm having enough trouble getting my brain to enjoy the smokiness of lapsang souchong (it seems to be the only tea that keeps me awake) - and at least that doesn't attack me! Those things look terrifying! Those barbs are horrible! We sell these at my work and I've been pricked many times whilst serving customers. Wow, I give you a lot of credit for going through all that! 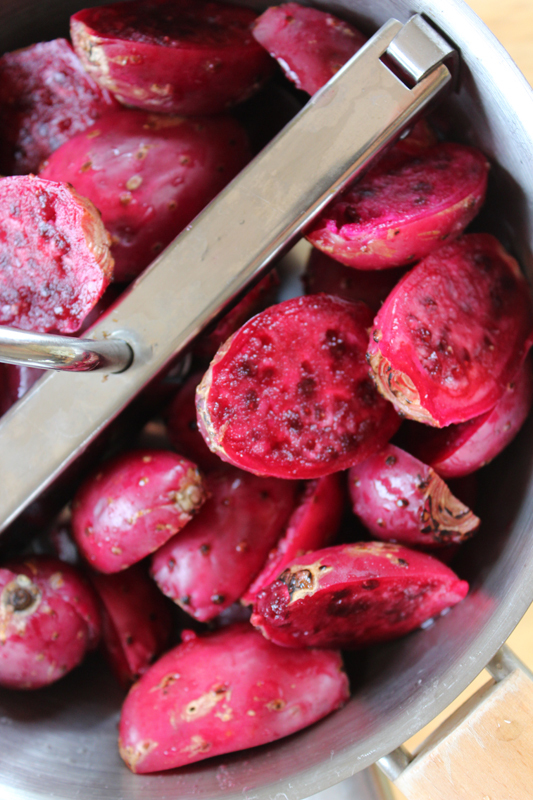 That said, I don't think I'll be buying prickly pears anytime soon, though you are right, they are a lovely color! Supposedly, at the store they already have the bad spikes removed. ??? But I have never seen them in a store, so I can't verify this! Smoked Juice doesn't sound too appetizing especially after all the work you put into making it. 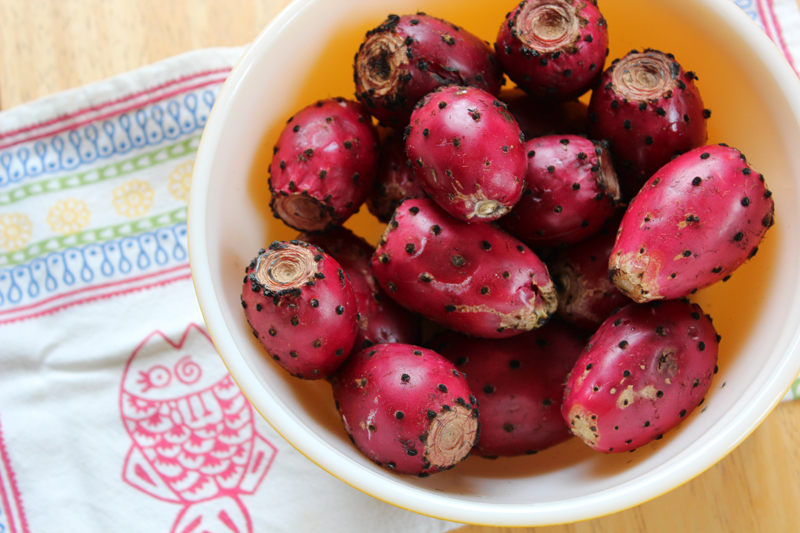 I see prickly pears in the stores around here sometimes and am always tempted to buy them. Perhaps I won't. 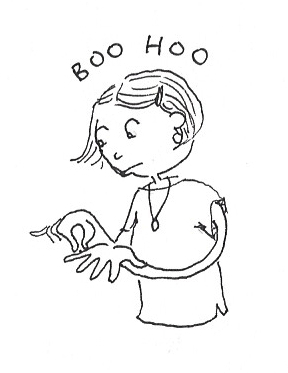 I don't want small little spikes in my hands. no, you really don't! I still had some in my hands this morning! I wonder how that smoky prickly pear juice would taste in some kind of a sauce or chili. I don't think I have ever had prickly pear before. In Montreal, we can buy those at the grocery store. I remember that during my childhood they still had the spikes on them. Now, those are gone, with a machanical procedure I guess.